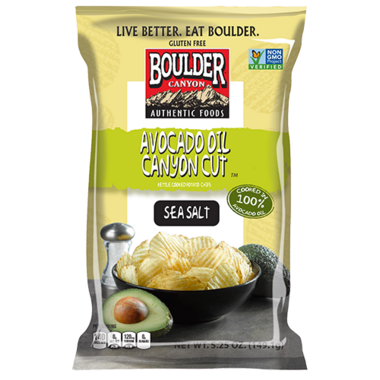 Featuring just three ingredients—avocado oil, potatoes and sea salt—Boulder Canyon™ Canyon Cut™ Avocado Oil chips take the “less is more” approach to allow the rich, buttery flavor of the avocado to take center stage. It’s the ultimate potato chip for connoisseurs who appreciate a purist approach to snacking, yet it’s a perfectly hearty chip for dip dunking as well! I've order a bunch of bags of chips from Boulder Canyon,i had 2 "flavours",the Kettle Chips Coconut Oil one and the Avocado Oil with Sea Salt. I've ate 2 bags in a row,i've start with the coconut oil one and my second bag was the avocado oil one. I've much prefer the coconut oil one. The avocado oil chips really taste "unnatural" to me,have a weird taste and after taste. 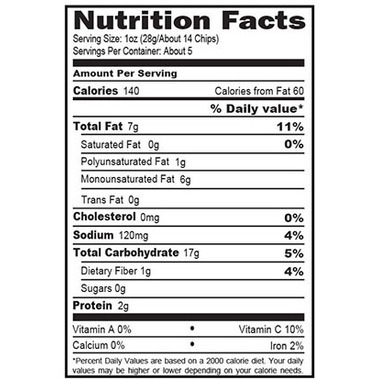 The coconut oil one taste much more like "regular/standard" potatoes chips. The coconut oil taste is very mild and definitively better for your health than the typical vegetable oil use by most of the chips producers. These are really good. Better than any others. My only problem is they are too crispy for my mouth. So I get my dip more runny than usual and let them sit in it a bit. It works. I certainly recommend them. These chips are better then any other chip I've had. Maybe its the avocado oil, but there are crunchy, perfectly salty and not greasy! I eat these when i'm craving chips, i like to pretend they are healthy. So tasty, so crunchy! Love that these are made with natural ingredients. Yummy! Love that they are made with avocado oil. Very crunchy and love the taste! Nice and crunchy and very tasty. Will reorder. These chips are good, but sorry to say I couldn't get used to the avocado oil flavor. I was really looking forward to trying them, but I don't think I would re-purchase. My husband and I loved these. I like the minimal, simple ingredients. Delicious. My wife says these taste good, but not as good as the coconut oil chips. When you are looking for something different, try this chips! The taste is perfect with a nice green salade! Really tasty and crunchy. I would buy again. Crispy, lightly salted, perfect, wouldn't change a thing! It's so rare to find chips without canola oil!